As the exclusive distributor of Waterfall Audio, we relish these opportunities to bring superior glass craftsmanship to new audiences. Nouveau Distributing, the exclusive wholesale representative for Waterfall Audio speakers in North America and the Caribbean, today announced scheduled appearances at two technology showcases this fall – the CEDIA EXPO in Denver, Colorado (from September 10-13, 2014), as well as The Luxury Technology Show in Beverly Hills, California (on October, 15, 2014). Nouveau Distributing will be using these trade shows to familiarize electronic integration specialists and luxury consumers with the Waterfall Audio brand. Managing partner of Nouveau Distributing, Joseph Kirby, will be on hand at both events to provide acoustic demonstrations of the glass speakers as well as answer any questions. The CEDIA EXPO is the leading tradeshow in the residential electronic systems industry, and will be held at the Colorado Convention Center. The expo is focused on allowing home technology professionals to experience the latest technologies, and connect with fellow industry professionals. Joseph will be meeting with professional audio retailers and integrators at CEDIA who may be interested in becoming dealers or incorporating Waterfall Audio into their next home theater project. As one of the premiere speaker luxury brands in the nation, Nouveau Distributing receives a significant amount of inquiries from design professionals seeking to create a unique, yet top-of-the line media room for their home automation integrations. Produced by RAND Luxury, The Luxury Technology Show will be held at The Petersen Automotive Museum. The show gathers media, retail executives, interior designers and affluent consumers interested in acquiring the world’s finest innovations. This invitation-only event showcases only 50 innovative brands to enable more one-on-one interaction between guests and exhibitors. A wide variety of industries will be represented at both shows aligning Nouveau Distributing with some of the world’s leading luxury and electronics brands. Nouveau is the exclusive U.S., Canada and Caribbean distributor for Waterfall Audio of France, whose glass speakers are highly regarded as much for being artistic showpieces as for their excellent sound. Founded by Joseph Kirby, the Nouveau team represents decades of design and installation experience in the professional audio/video industry. 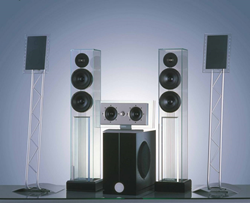 Nouveau Distributing was launched expressly to introduce the Waterfall line; sculptural works of art – precision music machines delivering exceptional sound.